Below is a screenshot from the application we’ll be building over the this two-part episode. 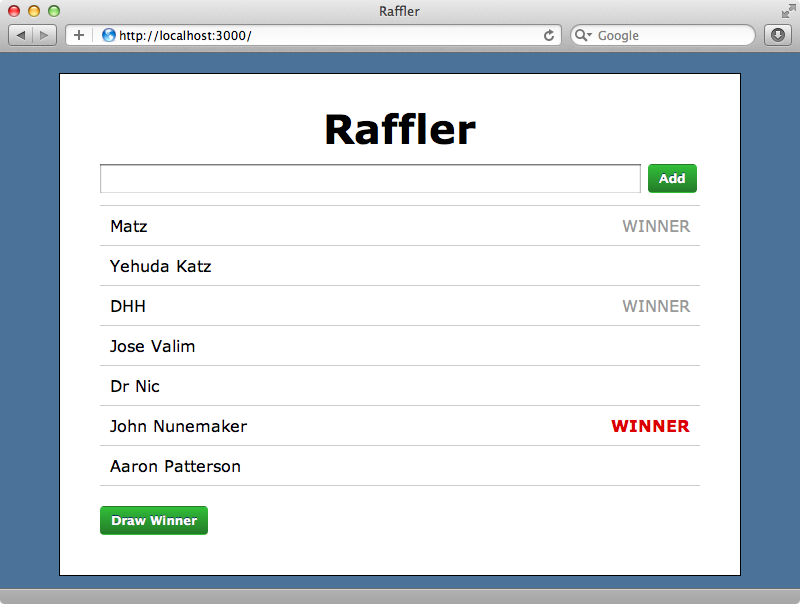 It’s called Raffler and we use it to add names to a list then click “Draw Winner” to select a random winner from the names. We can do this multiple times if we want to choose multiple winners. The s app is simple but it will serve as a good example for demonstrating the concepts in Backbone. 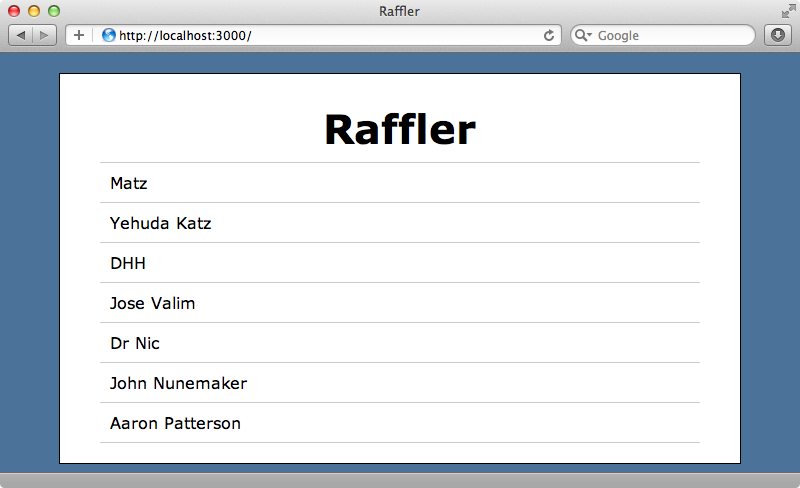 We’ll start by generating a brand new Rails 3.2 application that we’ll call raffler. We’ll leave the index action for now but we will change the view template, giving it a div with an id that we can use to insert views from Backbone and we’ll put some default text in it. We’ll need to make changes to the routes file too as we want this action to be the root path. Now is also a good time to remove the default index page. When we visit our application’s home page now we’ll see that index page. Now it’s time to add Backbone. To add it to our application we’ll use the Backbone on Rails gem. This provides some generators for providing Backbone support. It’s installed in the usual way by adding it to the gemfile and running bundle. Next we’ll need to run a generator to install Backbone. This will add some code to our application.js file and create a raffler.js.coffee file along with some empty directories. If we take a look at the application.js file we’ll see the changes it’s added. The Backbone generator has added underscore, which is one of Backbone’s dependencies, backbone itself and our newly-generated raffler file. It also includes all of the directories that are generated by Backbone. Note that there’s a warning in this file about empty lines and so we’ll remove the two blank lines from the file above. Next we’ll take a look at the generated raffler file. This sets up a Raffler object to act as a namespace for containing all the Backbone-related classes and objects. It also has an init function for starting up our Backbone application and this is called when the document loads. We can see that our Backbone app does start up by reloading the index page. We want our application to contain entries for a raffling contest so we’ll need some kind of entry resource. To do this we can use Backbone’s scaffold generator. This will generate various files for managing our new model. We’ve used an empty string to specify the route path and mapped it to an index function. For now we’ll just have this show an alert. This route won’t work yet as we haven’t set it up in our application. To do so we’ll need to instantiate the router class in our application when it loads. We do this by removing the alert in the raffler.js.coffee class and instead create a new instance of Raffler.Routers.Entries. We also have to call Backbone.history.start(). This triggers the matching router for whatever is in the URL. Now when we reload the page we’ll see the home page alert. Next we’ll try defining another route, this time for a single entry. This route takes a parameter and we define this in the route by using :id, much as we would in a Rails route. We’ve defined this route so that it calls a show function and this function takes that id as argument. For now we’ll just alert that id. By default Backbone uses the anchor part of the URL as a path so to visit the page for entry 123 we’ll need to use the URL http://localhost:3000/#entries/123. There are options to configure these URLs so that Backbone uses the actual path instead of an anchor but we’ll leave this as it is for now and cover this in part two. To render a template we call @template() which renders the template and returns it as a string. Each view has a dedicated HTML element that we access by calling @el. By using some jQuery code we can set the contents of this element to by whatever is returned by the template. Finally this function needs to return this view so that we can chain other view functions on it and to do this we return this (as this is CoffeeScript we could also use @ but we’ll stick with this here). We still need to instantiate this view and render it out inside the router. We’ll replace the alert in the index function and create a new Raffler.Views.EntriesIndex view instead. We then render the view into the container element on our index page. This will render the index.jst.eco template into out container div. This template is currently empty so we’ll put something in it so that we can see that it is being rendered. When we visit the home page now we’ll see that template rendered out. We want to render some dynamic content in our template and as it has an .eco extension the Eco templating engine is used to render it out. This behaves similarly to Erb and uses the same <% %> tags, but the code between the tags is CoffeeScript instead of Ruby. When we render the template from the view we can pass in an object with attributes and the template will be scoped to that object context. To demonstrate this we’ll add an entries attribute with some placeholder data. We now have access to that attribute in the template. When we reload the page now we’ll see that attribute’s value. A collection contains multiple models and provides some conveniences for managing them. We’ll set the url option on our Entries collection. This is the URL that it expects the server to respond to for managing this collection of records and it expects it to be a JSON REST API. When this class fetches the records it will send a GET request to this URL. Similarly when it creates a new record it will send a POST request to it. To fetch a single Entry it will send a GET request to /api/entries/<entry_id> and it will also use that URL to update an entity, with PUT, or delete it with DELETE. This means that it works in the same way that a REST interface in Rails does. Note that we’ve mapped this under an /api path so that there’s no potential conflict with the Backbone routing. After this generator has run we’ll need to add the new table to the database by running rake db:migrate. Next we’ll need to modify the controller so that it responds with JSON to those RESTful actions. There are a variety of ways that we can generate the JSON but here we’ll keep it simple and use respond_to and also respond_with in each action with the appropriate model call for each action. We’ll need to change the routes file now so that the entries resources is scoped under the /api path. Finally, we’ll seed the database with some example data. To populate the database with this data we’ll need to run rake db:seed. Now, when we visit http://localhost:3000/api/entries.json we’ll see a JSON representations of those entries. To fill it with data from the server we call fetch. This will make a JSON request and get all the entries. There are many methods that we can call on a collection thanks to the Underscore library and these are listed in the documentation. Many of these methods will look familiar as they are similar to Ruby methods. For example if we want to fetch a random winner we can call shuffle and if we call this on our collection of entries it will return them as an array in a random order. We’ll get a single entry by getting the first element of the array. We can then use the get function to get any of the model’s attributes. Similarly we can set attributes with the set function, passing in a hash of attributes. This doesn’t save the record or submit any requests back to the Rails application. To do this we need to call save. This will submit a PUT request to the server. If we want to create a new record we can use create. This will save the new record to the database by making a POST request to our Rails app. Back now to our Backbone app. The next thing we need to do is fetch the entry records then loop through them and display them on the index page. We’ll need to create a new Entries collection and we’ll do that in the entries router class. If we create an initialize function in this class it will be fired when a router is created. In initialize we create a new Entries collection then call fetch on it to get the records from the server. Ideally this would be pre-populated when we visit the page so that we don’t have to make a second request to fetch the records but this will work for now. We need to render the entries in the index view and so we need to pass this collection into it when we create it. Thankfully there’s a collection option we can use that will do just this. In that view now we’ll have access to this collection and we can pass this into the template instead of the placeholder text we’ve got now. Now in the template we can loop through these entries and display them in a list. For now, though, we’ll just output the length of the collection to make sure that our code it working as we expect. When we view the page in the browser we don’t get the figure we’re expecting, however. For some reason the collection is empty when we render the view. The problem is that when we call fetch on the collection it sends a request to the Rails app to fetch the records but it does this asynchronously. The view is rendered before the records are returned and so the collection is empty. To get around this we can use Backbone events so that we’re notified when the collection is loaded and we’ll do this inside the index view. We do this by overriding the initialize function that is triggered when the view is created. To listen to an event on a collection we call @collection.on and we’re listening to the reset event which is triggered when the records have been loaded into the collection. When event fires we want to trigger the render function so that the view is re-rendered and so we pass this as the second argument. We also need to pass this as a third argument which is the context binding for the function as it’s called. When we reload the page now we’ll see the correct number of entries listed. If we reload the page repeatedly we’ll see that when the page first loads it still shows zero records but that this is quickly replaced with the correct value when the collection is returned back from the server. Now we just need to loop through these records and display them in a list. The entries collection isn’t a simple array and so we have to call models on it to get an array of models. Note that it’s necessary to put a colon at the end of this line in Eco as it doesn’t use significant whitespace. In the loop we simply get the name attribute for each entry. When we reload the page now we’ll see the list of names. The view now has the correct data but it looks fairly ugly. We’ll make it look better by adding some CSS. There’s still a lot to be done here. We still need a way to add entries and a t randomly select a winner. These are things that we’ll tackle in part two of this series which will be coming soon. In the meantime take some time to read through Backbone’s documentation. This is nicely done and Backbone isn’t a large framework so it won’t take long to read through.